I’ve been trying to read this final installment of the series for quite some time, and finally finished it. I don’t know why – but when i started it back a few weeks ago, i got only a few chapters in and it wasn’t sticking. Lucky for me, i had a long plane ride yesterday and picked it back up to read since it’s airplane friendly reading…..and i’m thrilled that i finished it. 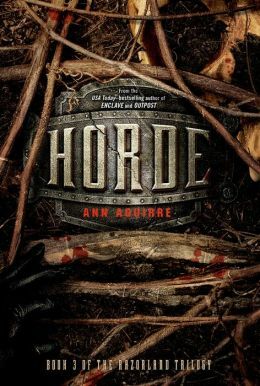 In this third and final book of the series, we are finding ourselves hanging in the balance again – where something needs to be done to kill the Horde of freaks before they kill the humans, and Deuce needs to find a way to convince people that they need to fight. The Huntress in her comes out full force in this story and we see her growing up quite a bit. After making an agreement with Colonel Park to get information from one of the other settlements, she has been given permission to try to create an army that’s not tied to one town, but that will band together to fight at One. while at first she finds little success outside of her settlement, she continues to push forward. Through the help of traders that are trusted by the other towns, word begins to spread that they are forming, fighting small battles and winning, and somehow manage to gain more recruits. Deuce finds herself with a set of new confidantes that are amazing resources to him. Now i’m kind of sad to see the series end, since i really enjoyed where it took us. There were characters that were adored that didn’t make it to the end of the book, and that made things all that much more bittersweet. the off point for me though is that usually i find an epilogue to be really helpful and a great way to provide closure. I’m not sure that this one really did that – or was necessary but i get why the author wrote it. Is it bad of me to hope that maybe there will be another novella that would give us another look into the underground and maybe where their story continues? i feel like there’s room for it now that Topside keeps changing. Just a thought – Enjoy! This entry was posted in Dystopian, Reviews, Young Adult and tagged Ann Aguirre, Dystopian, Horde, Razorland Trilogy, YA lit by iscm13. Bookmark the permalink.